We last covered Mats Klingberg and Trunk Clothiers in September 2010. 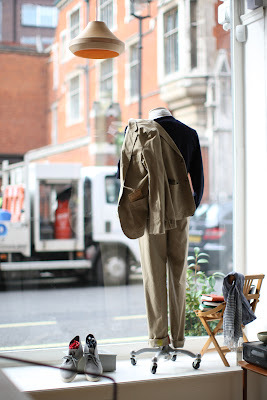 Back then it was a new store and a new concept for London – classic casual clothing from the best brands that Italy, Japan, Sweden and a few others had to offer. Largely not stocked anywhere else in the UK. Six months on, things are going well. Business is good, there are Trunk-branded sweaters and holdalls (some now retailing elsewhere), and Mats has more brands pitching at him than he can handle. Indeed, it now seems odd that the model didn’t already exist. Britain’s department stores are so dominated by fashion brands and sportswear that there are few places for small, craft-driven companies to sell to a discerning public. And there are so many great small companies in Europe, Japan and the US to pick from. Some brands have proved so popular that there is a waiting list system – for Incotex trousers, for example. Nearly all 32 and 34 inch models have sold out and the man who walked away disappointed while I was in the store was apparently only one of many. Let’s hope that these brands don’t just use Trunk as a stepping stone to a wider market in the UK – Incotex is already being sold on the new Mr Porter site. 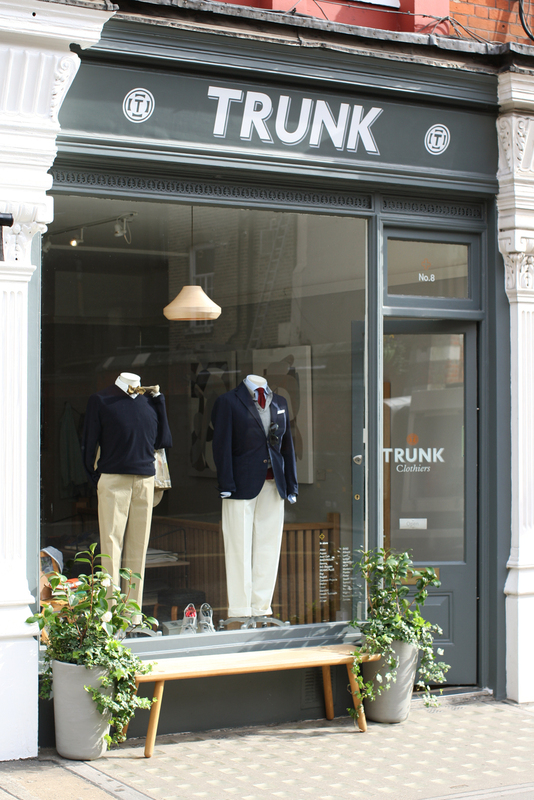 In the end, though, Trunk is about discovery, and its strength over the past six months has been the ability to shift between brands and bring in yet more gems that men in the UK have previously been deprived of. Avon Celli, for example, a brand of knitwear that was apparently favoured by Picasso and is still traditionally made (Trunk is stocking polo-necked sweaters in cotton for Spring/Summer). Or ts(s), a brand designed by Takuji Suzuki, the brother of Daiki Suzuki and who used to design for Woolrich Woolen Mills until they changed recently (he also designs Engineered Garments). ts(s) will be replacing Woolrich from Autumn/Winter this year – another way in which Trunk is evolving. Tomorrowland has also been added, with a range of striped sweaters. 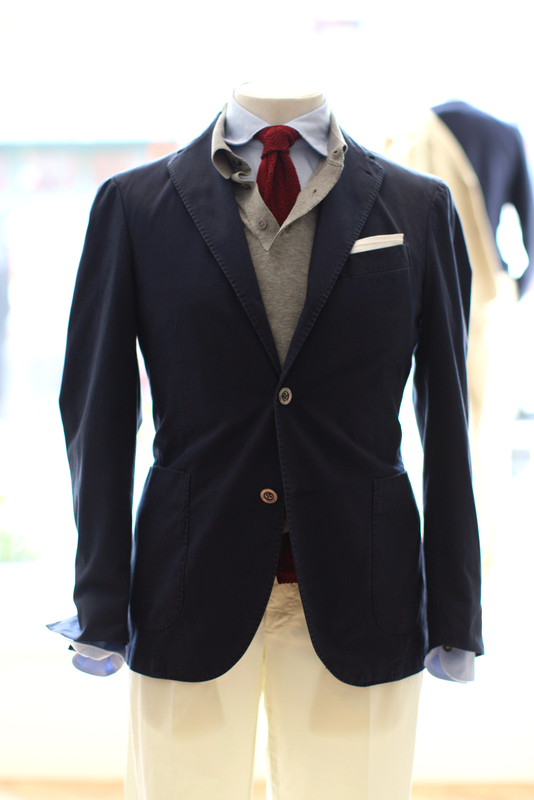 My favourites are Boglioli’s jackets and Trunk’s own sweaters. Boglioli does simple, unstructured jackets with an eye for great tailoring – though perhaps a little short for those with a taste for traditional bespoke. 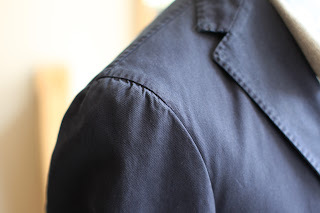 The Soho, a navy blazer in jersey picquet cotton, has already sold out and is being replaced; a favourite of mine from Autumn/Winter (and now on sale) is the Wight, a jersey grey herringbone; and new for Spring/Summer is the Coat, in a khaki cotton canvas. Something for every taste. As for Trunk’s sweaters, they are made by John Laing of Scotland. Simple crew and V-neck cashmere models, in navy, grey and natural biscuit. It’s amazing how hard it is in London to find sweaters that fit slim and aren’t made by a fashion brand. Traditional manufacturers nearly always make their sweaters too square; fashion brands add on needless details and are hideously overpriced. Trunk’s sweaters, designed by Mats himself, fit right in between. The Avon Celli sweaters can be seen in the pictures here, while the window shot shows the Boglioli Coat on a model’s shoulder. You can follow the discussion on Trunk Clothiers: Catch up by entering your email address in the box below. You will then receive an email every time a new comment is added. These will also contain a link to a page where you can stop the alerts, and remove all of your related data from the site.